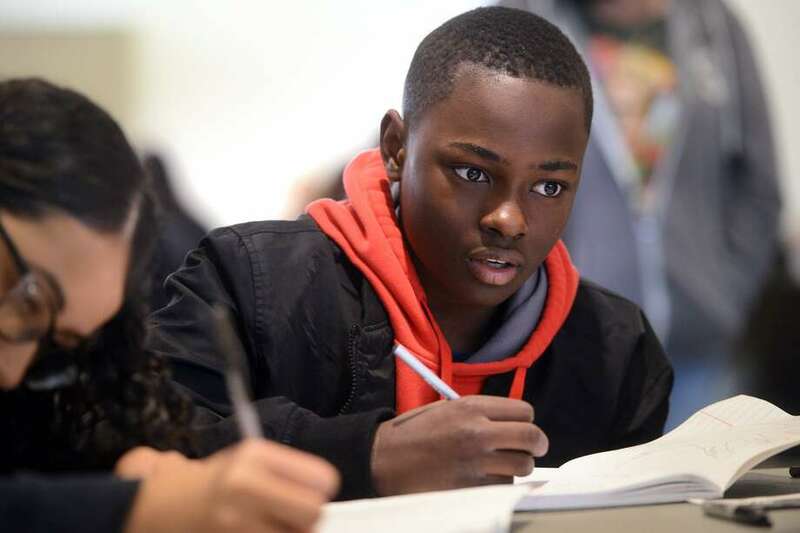 Anthony Dozier, a 7th-grader from Cesar Batalla School, in Bridgeport, works on an essay during a writing workshop at Fairfield University, in Fairfield, Conn. Feb. 1, 2019. The workshop was part of the university’s Dr. Martin Luther King, Jr. celebration, and included students from several Bridgeport schools, who discussed and wrote about King’s legacy. FAIRFIELD —Before a different audience, Bryan Ripley Crandall’s morning-long writing workshop might have been considered a cure for writer’s block. The objective in front of this audience of 77 Bridgeport middle school students was to inspire them to make a difference in their community. It was a fitting topic to cap off a three-day celebration of Martin Luther King Jr. on the Jesuit campus. Using the words of Martin Luther King and others, the students were challenged to write about what they know through a series of exercises. They began by copying one of several King quotes, then listing all the words that quote brought to mind. Then they had to use the same amount of time to jot down a longer list. They wrote lists of things they love and hate — or want to make better. There needs to be more focus on the present day, Choudhury said. Pollution was one of the things on Batalla seventh-grader Elsa Nguyen’s list. Janelle Newell, a Multicultural Magnet seventh-grader who last year competed in the Scripps National Spelling Bee, had “pressure” on her hate list. Also, people who doubt her — and who walk slowly in front of her. After putting it all down on paper, the students worked on possible solutions before turning to yet another writing exercise by putting together a story using a series of random words and then another based on illustrations from a picture book. Crandall, who heads the Connecticut Writing Project, told them there are power in words and encouraged them to write — and read — every day. Other events on campus during the week, which carried the theme of “Fighting for Racial Justice,” included a keynote speech by historian Ibram X. Kendi and an awards dinner featuring winners of the Jesuit university’s annual MLK Essay contest. The theme was how they would change their community. Choudhury won first prize in that essay contest. Also at Friday’s writing workshop were Jeff Brown, a Fairfield U alumni and first-year English teacher at Batalla School, and Anthony Dozier one of his students. Earlier in the week, the pair won an Action for Justice Award from the university. Dozier, a seventh-grader, not only wrote an essay about his dream of stopping bullying at Batalla, he put his words into action by forming a club. That club is hosting a week-long series of antibullying events in March, Brown said. Dozier said bullying at his school is an issue. Students call students names. He is trying to change it. “I want to make people see the error of their ways,” Dozier said. Many members in his club were with him on Friday. Others at the leadership conference included hand-picked middle school students from Claytor, Winthrop, Waltersville, Multicultural Magnet, Read and St. Augustine. Some said this was their first time on a college campus. Rony Delva, director of Upward Bound at Fairfield University, said this is the eighth year the university has hosted the youth leadership conference.